Bjorn Nils Anders Lamborn, Ph.D., former physics professor and chair, has left a $1.1 million endowment to establish an Eminent Scholar Chair in Theoretical Physics, and a $100,000 scholarship endowment. 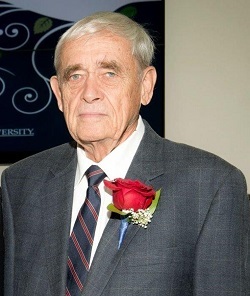 Bjorn Nils Anders Lamborn, Ph.D., former retired professor and chair of the Department of Physics (1970-74 and 1979-91) in the Charles E. Schmidt College of Science at Florida Atlantic University. Bjorn Nils Anders Lamborn, Ph.D., former retired professor and chair of the Department of Physics (1970-74 and 1979-91) in the Charles E. Schmidt College of Science at Florida Atlantic University, has left a $1.1 million endowment to establish an Eminent Scholar Chair in Theoretical Physics, and a $100,000 scholarship endowment for undergraduate physics students who are seeking a doctoral degree in theoretical physics. Lamborn, 78, passed away earlier this month. Lamborn attended boarding school in Sweden, where he earned his baccalaureate degree. He attended the University of California at Berkeley, where he received a bachelor’s of science degree and a master's of science degree. At the age of 22, he completed his doctorate degree in theoretical plasma physics at the University of Florida, making him the youngest Ph.D. in plasma physics in the world. Lamborn worked in Munich, Germany for approximately three years at the Max Plank Institute doing research before returning to the United States. He joined FAU as a faculty member in 1965, and worked there until January 2002, taking off one year to teach as a guest professor at Dartmouth College. Lamborn was instrumental in getting the Ph.D. program in physics at FAU approved in 1988 and oversaw its implementation. He served as associate dean of operations for FAU’s College of Science from 1998 until 2001. He retired in 2001 and was given the status of emeritus professor in 2002, continuing his research in theoretical and space plasma physics, chaotic behavior and non-linear wave evolution from 2001-02. Lamborn also was passionate about corgis and was the founding member of the Sunshine Pembroke Welch Corgi Club. He was a longtime member of the Pembroke Welch Corgi Club of America, the national parent club for the breed and served two board terms. Lamborn founded and was president of the Charitable Trust, a nonprofit organization dedicated to the health and welfare of Pembroke Welsh Corgis and other canines; accomplished through providing scholarships to veterinary students, education of Pembroke breeders, funding research into various canine health issues, and funding disaster relief trailers throughout the country that allowed household pets to be cared for during natural disasters.